Fiction – paperback; Penguin; 221 pages; 1992. 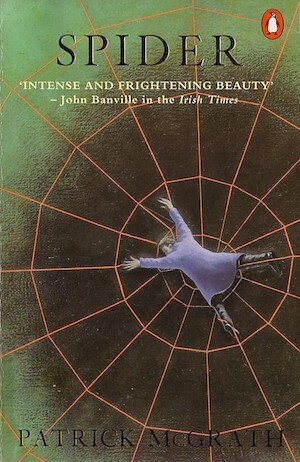 I read Patrick McGrath‘s Spider — first published in 1990 — back-to-back with Nathan Filer’s Shock of the Fall. Both books are about mental illness, but McGrath’s is written in a more eloquent, old-fashioned, literary style, and left a far deeper impression on me. I don’t say this lightly, but it’s perhaps the best book I’ve read all year. The Spider of the title is Dennis Cleg, a troubled man who has returned to London from Canada, where he has been living for the past 20 years. He now resides in a half-way house not far from where he grew up in the East End, shortly before the Second World War. He spends his days wandering once-familiar streets and canal ways trying to adjust to a new life outside of the psychiatric hospital from which he’s recently been released. I went down to the river, to a pebbly strand where as a boy I used to watch the barges and steamers; in those days they ran on coal, and constantly coughed cloudy spumes of black smoke into the sky. You reached the strand at low tide by a set of tarry wooden steps beside an old pub called the Crispin. Down I’d go to sniff around the boats moored there, old battered working boats with smelly tarpaulins spread across their decks, all puddled with rainwater and green with fungus. Often I’d climb onto the deck and creep under a tarpaulin, in among the iron chains and the damp timbers, and settle myself in a tick oily coil of rotting rope — I loved to be alone in that damp gloom with the muted screaming of the gulls outside as the wheeled and flapped over the water. These childhood haunts bring back many memories for Spider, who furiously records them in a journal, which he is at pains to keep from prying eyes. In it he recalls how his father, a plumber with a violent streak and a fondness for drink, took up with a local prostitute, Hilda, whom he met in the pub. Shortly afterwards, his mother mysteriously “disappeared” and Hilda moved into the family home. He was a shy, pensive boy, but after his mother “goes to Canada”, he became even more withdrawn. He coped by learning to separate himself into two people — Spider, who scuttled about and disassociated himself from his grief, and Dennis, who presented a face to the real world. As he looks back on these traumatic and troubling events, Spider’s narrative gets increasingly more disturbed in tune with his own behaviour, which becomes more erratic, odd and paranoid as he remembers more and more of his past. He wears all his clothes at once, tapes newspaper to his body, hears unexplained noises in the attic above him, frequently smells gas, and hides his few possessions in a sock worn on the inside of his trouser leg. What results is a psychological thriller of the finest order, perfectly paced and structured, and with a satisfying, if ambiguous (and troubling), denouement. Without a doubt, McGrath’s second novel is a rather extraordinary achievement. It has so much atmosphere. You really get a feel, not only for that period in London history — the oppressive fog, the dodgy outhouses, the murky canal, the noise and conviviality of the pub, the dank and seclusion of the allotment garden — but also of Spider’s fear, pain and neglect as a child. The story is told in the first person entirely from Spider’s point of view, and sometimes it is hard to determine how much of what he tells us is real or a figment of his madness. His account is so vividly drawn, however, and so filled with pain, confusion and a distrust of all those around him that is hard not to immediately take his side, to wish you could walk into the book and make it all better for him. The prose has such an emotional impact because there’s a complete absence of pity and sentimentality in it. It becomes even more emotional (and shocking) when you discover the secrets at the heart of Spider’s fragile mental state. Sadly, Spider appears to be out of print — I bought mine from a charity shop several years ago — but there are plenty of second-hand copies sloshing around the internet for just a few pence. Alternatively, you could watch the 2003 film adaptation — directed by David Cronenberg based on a screenplay by McGrath — on DVD, which features Ralph Fiennes in the starring role. His performance as Spider is absolutely mesmerising: fragile and powerful, but also deeply disturbing, too — just like the book. Thanks, Susan. That’s interesting and helps explain a lot. I’ve read “Trauma” and “Ghost Town” and both were about psychiatry. I quite like the way he explores the dark side of the mind. He does it very humanely, I think, no doubt helped by his first hand experience working in a mental health hospital. I definitely need to track down a copy of this. Is there an Abebooks Australia? I tend to buy most of my secondhand books via Abebooks (rather than Amazon marketplace) cos the descriptions of the book’s condition is usually much more accurate. Alternatively, try bookfinder.com. No Abebooks in Aus, but I can always buy from the UK if need be. I have a couple of pretty good second hand bookshops that I will try first and then go from there. We also have brotherhoodbooks.org.au (run by The Brotherhood of St Laurence) but they don’t have a copy at present. I’ve just checked again and brotherhood books do have a copy so I shall buy one now! Can’t wait to read it.